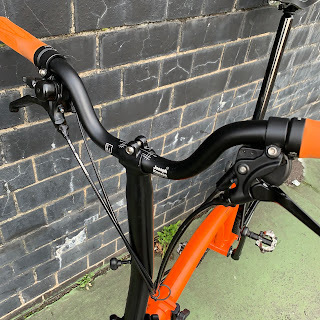 My Orange Brompton: New handlebar for my Orange Brompton!! I have always liked the S type version of the Brompton. I am on number 3 in fact but I have been thinking long and hard about whether or not this still works for me. I do use my Brompton for its intended purpose - multi-modal short trips. However, I tend to use it more for journeys probably only a devotee to the brand would attempt on a regular basis. 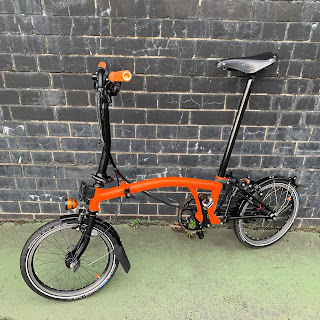 My Brompton has seen me riding through the night 60 - 70 miles at a time, ascend dreaded hills such as Ditchling Beacon and also attempt longer rides of 100 miles or more such as the Dunwich Dynamo. 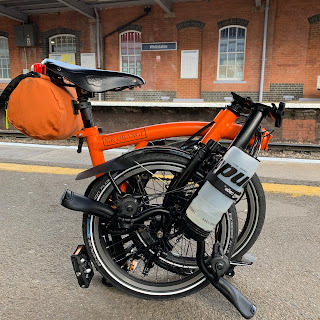 This year I hope to use my Brompton on lots of these adventures but there had been a problem using the S Type that doesn't seem to be getting better. I have found that on longer rides the cycling position afforded by the S type brings neck and shoulder ache. I don't know whether it is because I am getting older or the fact I am quite tall, but I just don't seem to be able to get away from this. I did think about fitting some bar ends or Ergon grips as they would definitely help with regards comfort. Certainly the orange grips I have on at the moment are lovely to look at but they aren't very comfortable. In the end I decided to go down a different and ultimately more long-term solution. Joseph Kuosac make all manner of after market components for Brompton bicycles and I was aware that they made a handlebar for the Brompton. 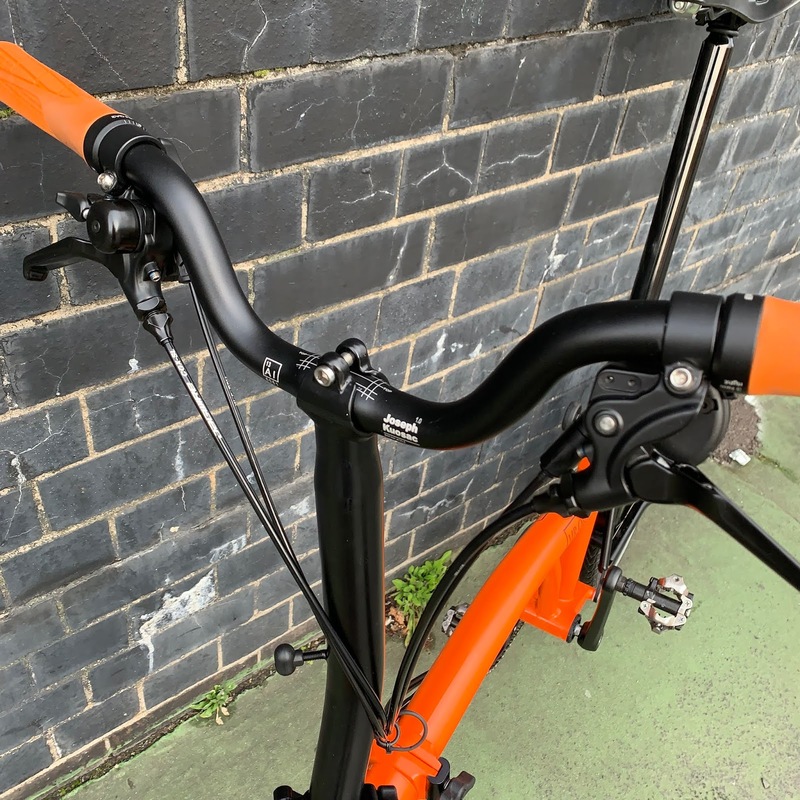 This is the mid-rise which when fitted to an S type stem brings the handlebar height and ride position almost the same as the new M type. Quite a radical step in many ways but for me at least the best long-term solution and the cheapest option. I say cheapest as the alternative might be going do ether new stem/handlebar route. (Remember these words for later on). 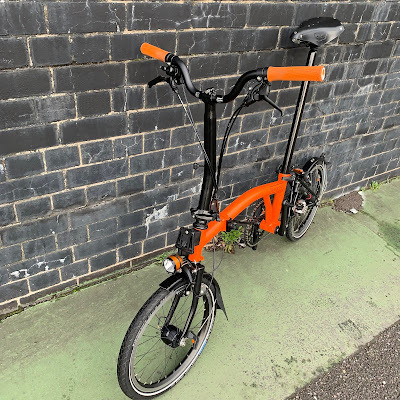 The Joseph Kuosac mid-riser in black is readily available for around £20 and looks pretty good - better than the new official Brompton M type handlebar in my opinion. The only other thing I needed to buy would be new M type cables. I had a few of these anyway so didn't need to buy that many. Taking the cables off was easy enough. If you think about doing this or replacing your own cables (it isn't that hard) just make sure you take a few photos or perhaps a short video clip of their currant position so that you can refer to it afterwards. Undoing the handlebar bolt I took out the straight S bar and got the new one ready. As I put the S type handlebar to one side I had a tinge of regret at having to take it out. It didn't last long. 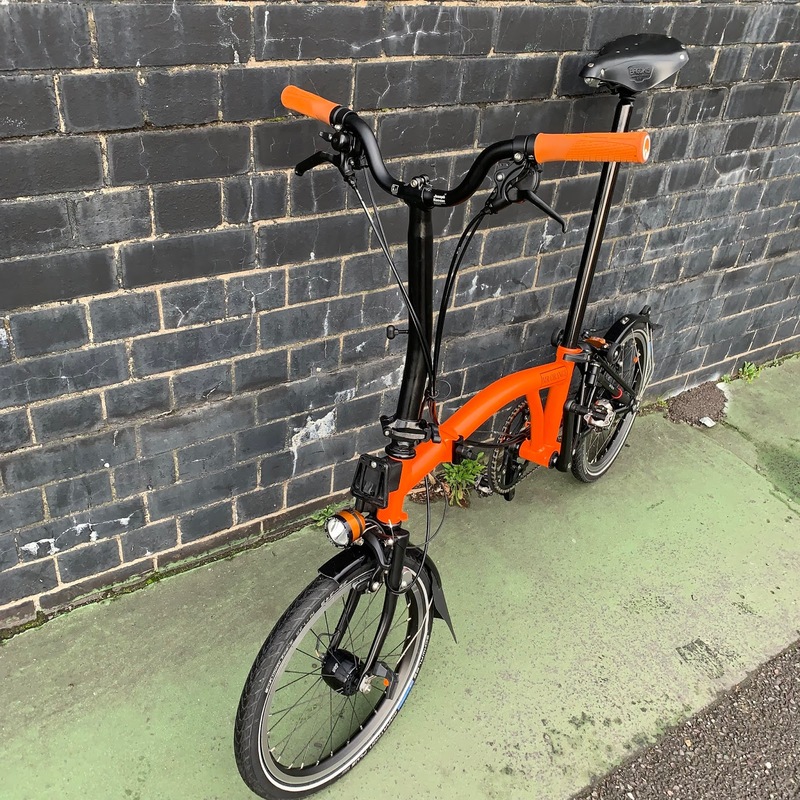 I have already ridden a Brompton with exactly the same set up as I was intending and it felt much better. Putting the new Kuosac handlebar in position I folded the bike to see how much on each side I would need to cut off. I estimated that I would need to cut 6cm on each side. The Kuosac bar comes with very handy centimetre celebrations to let you know easily how much you are cutting off. Fitting the new M type cables was easy and didn't take very long. In the space of a few minutes the bikes was cabled up and looked pretty good on the bike stand. I took it outside for a quick spin around the block and liked the ride position instantly. Taking it back inside I only had to tighten the centre bolt that attaches the handlebar to the stem. That is when things took their disastrous turn. To cut a long story short I made the rookie mistake of over tightening the bolt. Before I could stop myself I had sheared off the thread of the bolt and those it threaded into on the stem! Oh dear! (I have cleaned that last comment up)! There was nothing for it. I took the bike to the brilliant people at 'Compton Cycles' for them to buy me a new stem and fit it all back together again - yes you read correctly. I collected the bike today and it felt wonderful when I rode it. I could have just opted for an M type stem as I had ruined the original S type one - I had to pay for a new stem anyway. I decided to stick with an S type stem and the Kuosac riser bar. 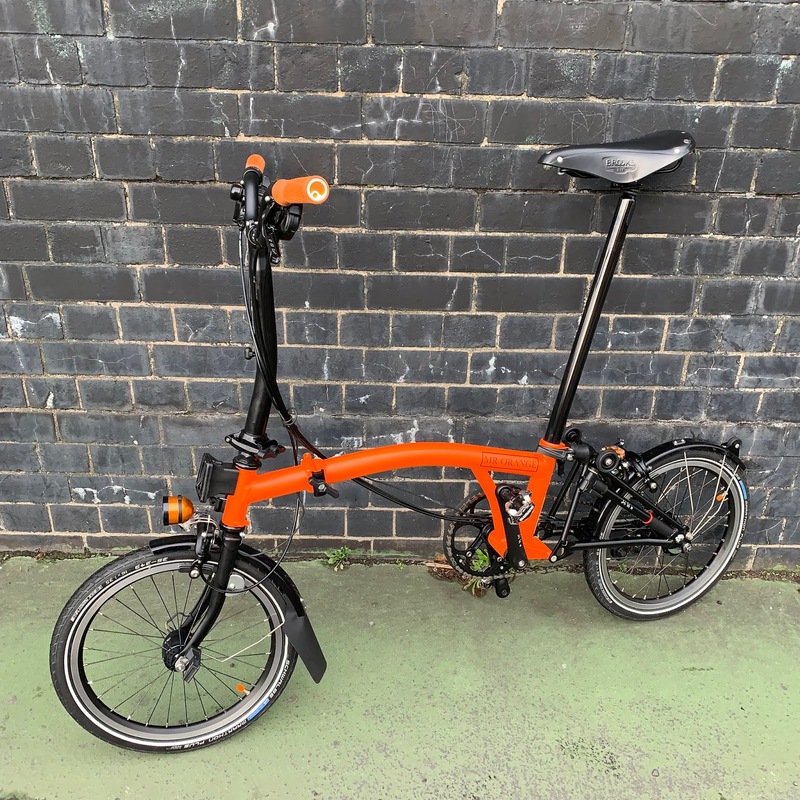 I still have the S type handlebar and cables and know that if I ever wanted to go back to the lower position of the S type (if unicorns fly and I ever got into the Brompton World Championships) I could. i have 60 and 70 mm risers on my m-stems older style, angled forward about 45 degrees. gives about the same position as the s-stem, but adjustable. Width not an issue here as only 5mm wider than standard Brompton bar. Next stop is a Joseph Kuosac carbon wheelset. Only $1,348. For that money I'd just buy a new bike. The new setup looks ... stunning. I hope you have enjoyable, ache-free, times ahead on this lovely bike. Many thanks. At the moment I’d definitely a fan of this setup.